Marketing is all about helping your customers to buy and enabling your business to grow. That's why revenue, customer-centricity, continuous improvement and teamwork are the guiding principles of how we work with our customers at Advance B2B. In marketing, the bottom line is the top line. Traffic, leads and MQLs don't pay the bills. Dollars do. While these KPIs indicate whether you're moving in the right direction, marketing shouldn't measure its success on proxy metrics. That's why everything we do is focused on accelerating the growth of your business. We believe that the closer you can get to your customer, the more successful your marketing - and business - will be. 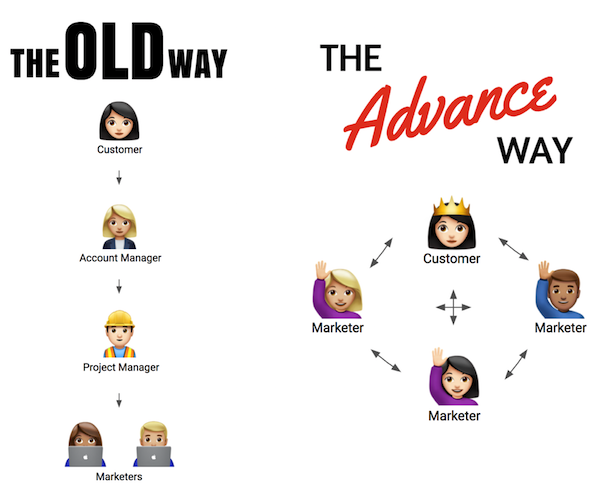 The old agency model was built upon unnecessary intermediaries and hierarchies. This meant a new customer would be passed from sales to account manager to project manager and eventually to marketers. There is a better way, and that's why the people you talk with in the sales process will be the people you work with on a daily basis. Then we can move on to operations, agile marketing and continuous improvement. The world moves fast. Your marketing must do the same. Once upon a time marketing was all about yearly plans, but things move so quickly that traditional methods no longer work. That is why our processes are built on the principles of continuous improvement and agile marketing. By meausuring, planning and executing marketing on a monthly sprint basis, we can focus our efforts on activities that will deliver the biggest impact for your business. This approach allows us to test our hypotheses quickly and with little risk before scaling up the things that work. This way we will continue to learn and improve the performance of marketing in the long run. It's all about ensuring we are a little better tomorrow than we are today. Together, we work as one team striving to achieve a common goal. The best results come through close, honest and transparent collaboration, and that’s why we view our relationship as a partnership. We will make you rethink the way you approach marketing. So if you are looking for a partner to outsource some of your marketing tasks then this is not the right place. But if you're looking for a partner who will help you become more customer-centric, make decisions based on data, and ultimately grow you business, then we could be a good match for one another. If you'd like to discuss more with one of our marketing experts then grab a time from our calendar or get in touch with us.